Understanding fretboard notes is a great challenge for many guitar players. Many students don’t know where to start. When I first started learning the guitar I had a desire to master the fretboard notes. It has taken many years and many days of practicing but today,I feel like I have a better grasp on all the fretboard notes. 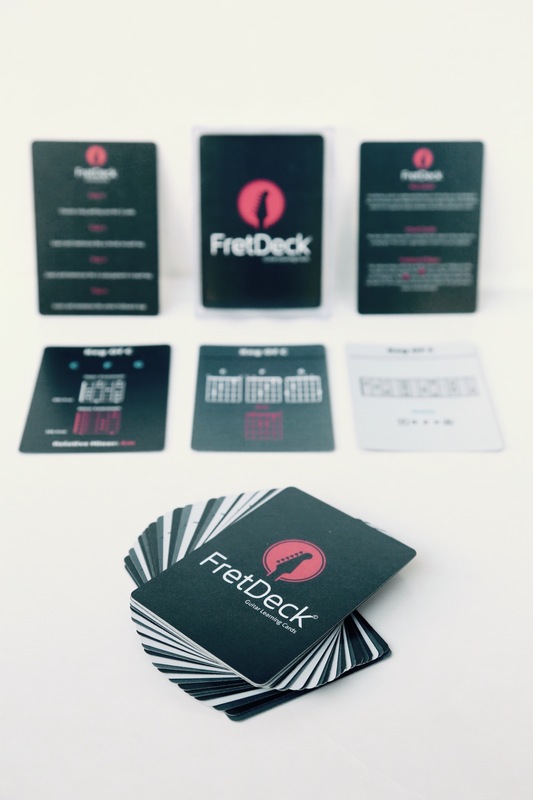 The FretDeck allows students of the guitar to quickly understand the layout of the fretboard . Guitarists can quickly reference a key and select all of the notes in the key. With the unique design of the FretDeck, guitarists can locate the root notes and relative notes across the entire fretboard. With practice, guitar players can have pentatonic scales mastered in every key. Most beginning guitarists only learn chords to play and create songs. What the FretDeck does, is it helps beginning guitarists to understand the connection between keys,chords and scales across the guitar. This is essential to understand because it will allow guitarists to have the ability to recognize and actually use music theory in their daily practice routines or when they are playing in a band. While writing songs or learning songs students of the guitar can study the fretboard notes with the FretDeck. Analyzing the fretboard can help students write strong melodies over chords. It can also help understand which notes across the fretboard are blue notes(notes that can be bent up a half or full step). You can get very technical with the melodies that you write using the FretDeck. Studying the fretboard like this allows you to become a better guitar player and gives you the ability to write good music that is consistent with music theory guidelines. To understand fretboard notes you must practice and apply the content found in the FretDeck!